I like checking out cookbooks before I actually commit to buying them. I know I'm weird but I need to see if there are enough recipes inside, that I would make, to justify the purchase. So when I find a cookbook I’m interested in I usually try and borrow it from a friend or the library first. My latest cookbook of interest is Rose Levy Bernabaum’s, The Cake Bible. After several weeks on a waiting list I was finally able to check it from the library this past weekend. I have to admit I liked this book almost immediately. Recipes range from basic pound cakes to the more advanced and intricate wedding cakes. All of the recipes include nutritional information and most importantly all give various measurements for ingredients. When I bake I like to use ounces vs. cups. With the cake Bible I don’t need my conversion chart to tell me how many ounces 2 cups of sifted flour is. It’s all done for me. Makes baking that much easier. After browsing through the book several times I finally decided to try baking the Golden Almond Cake. Made with ground almonds, almond extract, and just a dash of vanilla the cake was bursting with flavor. The book suggests serving it with either chocolate shavings, powdered sugar or raspberry sauce. Although, I made the raspberry sauce I decided after the first piece that it didn’t need it and that I actually preferred the cake with just a light dusting of powdered sugar. I would definitely make this again and would not hesitate to recommend it to anyone. It was very simple to make and very delicious to eat. I’m looking forward to actually purchasing my own copy of the Cake Bible and trying out more of the many recipes inside. Preheat oven to 350 degrees. Grease a 9-inch-by-2-inch cake pan or 9- inch springform pan; line the bottom with parchment or wax paper, then grease it again and flour it. In a medium bowl lightly combine the eggs, ¼ of the sour cream and the extracts. In a large mixing bowl combine the dry ingredients and mix on low speed for 30 seconds to blend. Add the butter and remaining sour cream. Mix on low speed until the dry ingredients are moistened. Increase to medium speed (high if using a hand mixer) and beat for 1¤½ minutes to aerate and develop the cake's structure. Scrape down the sides. Gradually add the egg mixture in 3 batches, beating 20 seconds after each addition to incorporate the ingredients and strengthen the structure. Scrape down the sides. Scrape the batter into the prepared pan and smooth the surface with a spatula. Bake 35 to 45 minutes or until a wire cake tester inserted in the center comes out clean and the cake springs back when pressed lightly in the center. The cake should start to shrink from the sides of the pan only after removal from the oven. Let the cake cool in the pan on a rack for 10 minutes. Loosen the sides with a small metal spatula and unmold, or remove the sides of the springform pan. Allow to cool completely before wrapping airtight. I bought that book when it first came out and it is the best! I've never made that almond cake but it looks great. I do the same thing as you - try out books from the library first, if they have them. I've got Dolce Italiano right now and it's due back soon! 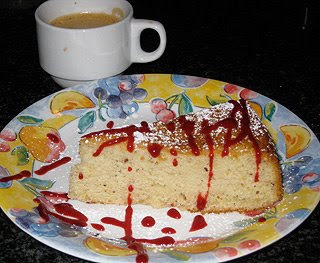 We have just added your latest post "The Cake Bible's Golden Almond Cake" to our Food Directory . You can check the inclusion of the post here . We are delighted to invite you to submit all your future posts to the directory for getting a huge base of visitors to your website and gaining a valuable backlink to your site. SO FUNNY! I was just looking at my copy of this book today! I love it- The cake looks fab, and you can borrow my copy anytime! This looks wonderful. These types of cakes are my favorite to eat. The cake sounds great with the double-dose of almond flavor, and so pretty with the raspberry sauce. I have this book - I received it as a Christmas gift. I have yet to use it but it is a wonderful book, there are so many great tips and beautiful cakes in it. Ground almonds are an amazing cake ingredient. Love the sound and look of this one. looks absolutely tempting. love it!!! This looks delicious. I should really check out cookbooks before I buy them, that's a good idea! I have bookmarked this cake. Almond is my favorite (second to fig!). Thanks for trying it out first!